The Stinger is a smaller version of the Scorpion. 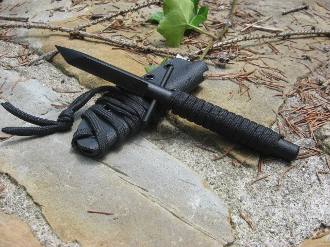 It is designed to be a covert carry self defense knife which can be worn around the neck or laced into a boot. The stingers have a tanto grind. The cylindrical blade and steep grind gives the knife the added strength for maximum penetration. The knife is made out of O1 tool steel, 3/8" thick heat treated to RC 60 with a black powdered coat finish, 6 inches overall. They come with a kydex sheath. Handle wrap can be multiple colors of 550 cord wrap.